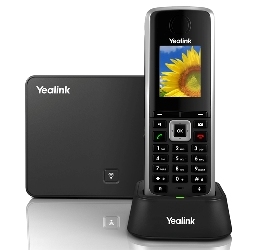 The Yealink W52P is a high quality business class SIP cordless phone system. High definition (HD) voice quality and up to 10 hours talk time battery life make this a great option for those that need mobility in their workplace. Use the tabs below to navigate to various information options. The Yealink W52P was tested with our PBX systems, including Elastix, 3CX and FreePBX. The first part includes our view of this device and the second part includes installation instructions that apply to most systems. Certain business models require mobility when inside the office as not all who need constant access to communication tether to a desk. The cordless DECT (Digital Enhanced Cordless Telecommunications) handset is invaluable for its ability to stay on your body at all times. The clip that comes with the unit comfortably attaches to a belt or pocket. The base station that connects to a switch or router is small in size and may be mounted to a wall. It will allow up to five handsets to connect and each device has the capability to retain 5 different VoIP accounts making shuffling the devices around fairly simple. 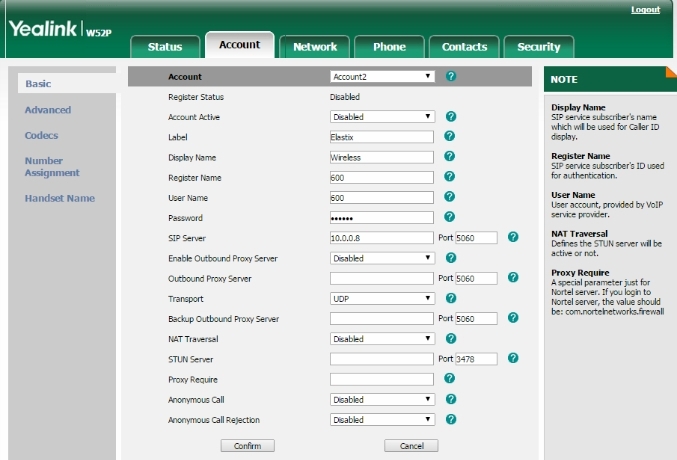 It is very easy to setup and register with a phone system. This can be accomplished by visiting the web management console for configuration, entering the settings directly into the device or by using an auto provisioning option featured for certain services or PBX systems. Navigating through the phone is very intuitive. Accessing features like the directory and other options is not a tedious process by any means. The phone includes HD technology (High Definition) which is noticeable during both internal calls and outside external calls (i.e. to the PTSN or a mobile network). Both the regular handset speaker and the speakerphone produce very clear audio. All the components are fairly small so positioning the hub and charging station should not require a major reorganization effort. The phone is light but does not have a cheap feeling like many smaller handsets. It is very responsive, although some areas of the menu momentarily hung but this is not a problem with normal usage. Setup should be a breeze with just about any system. After accessing the web administration page for the device, it only took a couple minutes to apply the credentials for an unused extension in the PBX. Battery life is around 10 hours on a full charge so it can keep up with a long day in the office even if you forget to put it back on the charger at lunchtime. The range of the handset is also impressive as quality of the call did not appear affected as I moved away from the base station to the next office. The specifications state a range of 164ft indoors and up to 984ft outdoors. Yealink also have DECT repeaters available if you need to extend the range or to improve signal recpetion in remote areas. All complaints against the device are relatively minor but are noted here for completeness. The first issue encountered is concerning the power supply. The main station is Power over Ethernet (PoE) capable but will require a power supply (included in the box) if the switch or gateway to which it connects lacks this feature. The transformers on the supply face the side which can be a little awkward for some surge protectors or cover an available socket on an extension device. The screen size is rather small but that is typical with handheld devices. If you have issues with buttons/keys on other handheld phones then expect the same here also. Some phones provide two ports and an internal switch so you only need to bring one Ethernet cable into a work area for both phone and computer use. The base unit only has one Ethernet port so that is not possible here. However, the wireless nature of this system means you can have the base unit located somewhere near a router and out of the way. Small form factor and various mounting options makes the device easy to position and port around an office. Utilizing PoE capabilities is best especially when connecting handset stations to the same power receptacle. Simple to connect to a service provider or PBX system. Many systems can auto provision the device with an existing extension with a just a couple of clicks. Great quality even when the handset is moved a considerable distance away from the hub. After rearranging power supplies and resetting the device, I was very pleased with the operation of the Yealink W52P. A lesson learned from my experience shows that it is good practice to reset any used device, thus eliminating potential issues from existing settings. Normally, I prefer larger devices but the tactile response of the buttons (compared to tablet or smartphone) makes the refined size of this device perfect and functional. Those constantly on the move within their place of work may find this to be the ideal business phone considering the portability and level of communication quality the device provides. Quick Start Guide and reference guide. A CD containing a full user manual. The base station, the W52P handset, a charging station, and two interchangeable power supplies. A wall mount bracket and a pocket/belt clip for the handset. Every provider and PBX system will be slightly different. If utilizing a hosted provider, credentials should be provided for you. When connecting the device to an internal system, the following steps must be completed before the device can be used. As my device had been previously used, knowing how to reset the phone is critical when purchasing a used device or in simply repurposing a device used with another system. To do this, type the IP address of the device into a web browser of your choice. Input the user name and password (both are admin by default). Visit the Network tab and select Upgrade. Here you will find the option to return the device to factory settings as well as upgrade the firmware on the device. I connected my Yealink W52P to an Asterisk based system known as Elastix. As many PBX systems rely on a nearly identical configuration console, provisioning the device with extensions created in the system will be very similar. This particular phone can be provisioned in different manners but the easiest method requires accessing the web console to input the settings for the desired account built into the phone. After accessing and logging into the web console, the following steps will work with most PBX systems. If connecting with a hosted provider, refer to the provided documentation or contact support to acquire the appropriate credentials for the device. Navigate to the Accounts tab: Here, select the account you wish to configure from the drop down box at the top of the page. Label: This is simply a name to be associated with account. The next option, Display Name, is also used to identify your device during internal calls. User Name: Sometimes required by a hosted provider. In many situations, this will be the same as the next item on the list. Register Name: The value here refers to the extension in your PBX system or whatever value is furnished by a provider. Password: Text entered here should match the password associated with the extension or the string of characters issued from a provider. Confirm the Information: Click the confirm button on the bottom of the page and the device should reset and apply the settings. Though there are other settings seen in Figure 1 above, like the outbound settings (likely required for a hosted provider), the device should be ready to make calls. If you have a system like 3CX that offers auto provisioning, setting up the phone is even easier. See figure 2 below. The system will recognize new devices connected to the LAN almost immediately. Here, I reconnected the T22P previously used with the system and the W52P. With either, I simply need to click the device, select the Add to Extension link at the top and select an extension from the menu that appears. The Yealink W52P may cost more than many corded handsets but considering the benefit of a mobile handset, the extra money is worth it. Businesses operating in SOHO or individuals needing mobility around the office should consider this device. We're sorry, there are currently no user submitted reviews for Yealink W52P matching your search criteria at this time. Please add your own review or check back later as reviews are being submitted often. Disclaimer: The opinions, views and ratings expressed in these reviews are those solely of the reviewer who submitted the review. WhichVoIP does not necessarily agree with any of the expressed opinions, view or ratings. WhichVoIP does not guarantee the accuracy of this information. Please visit providers website to confirm information.